Modern casual meets sport with this new Tommy Hilfiger multi-eye watch for men. Crafted of stainless steel, it features a two-toned stainless steel 46mm case with a sleek bezel. 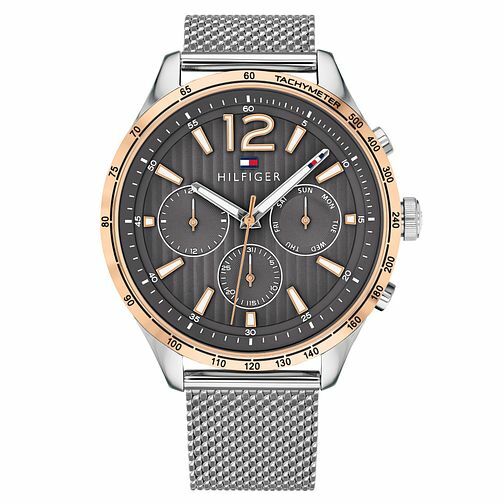 The textured multi-eye grey dial with stick markers and fine line minute track is detailed by the Tommy Hilfiger flag logo positioned at the 12-o-clock mark. Classic American style with a refreshing, contemporary edge by Tommy Hilfiger. Free Standard Delivery available on orders over £100. Free Next Day Delivery available on selected orders over £499. Free Click & Collect to any Ernest Jones store in the UK. For more Delivery Information click here. *We cannot refund or exchange pierced jewellery, e.g. earrings, if they have been removed from the original sealed packaging due to hygiene reasons. Click here to see our full Returns policy. There are a number of different ways to contact us if you need help or advice with your purchase. Be the first to hear about exclusive offers, news and products. ©Signet Trading Limited 2019. All rights reserved. Ernest Jones and Love & Life are trade marks of Signet or its licensors. You are now set to receive our newsletter. You are already subscribed to receive our newsletter. We believe your session has timed-out. Please refresh this page and try again.